If you're stuck with a problem in Windows 10 and you don't know where to start, we've compiled this guide to help you find assistance. If you have a complex issue that requires further technical assistance, or you’d prefer more direct help, then you can get in touch with Microsoft. If you are after general assistance or an overview, Microsoft does have a plethora of text guides and tutorials for Windows 10 on its support pages. Windows 10 has a built-in support centre – found in the Contact Support app – and it can take you directly to technical support. The fastest way to find the app is to type, ‘Contact Support’, into the search box on the Windows 10 taskbar. From there, you can click straight through to the app, find out more about setting up your PC, and get further assistance from Microsoft’s Windows 10 support team. If you’d prefer not to wait in a long telephone queue (and potentially run up your phone bill), the Contact Support app can also get you to Microsoft’s community forums, and allow you to put in a request to Microsoft’s call-back service, Answer Tech. Another alternative, if your query isn’t urgent, is to get in touch with Windows Support via Twitter. Sometimes, though, there are things that even Microsoft’s support team may not be able to help you with. In that case, turning to fellow Windows 10 users and independent experts can be the best way to gather information about how to solve problems you’ve encountered. If you’re attempting to get specialist or older software to work on Windows 10, then getting in touch with the software’s manufacturer, or seeking assistance on their forums, if they have them, is often a good place to start. However, as always, you should take care when surfing web forums. You may have the need to share details about your computer’s specifications and OS in order for good Samaritans to assist you. But you should never disclose confidential passwords or user account information to anybody. If you're having trouble with Windows 10, you probably want to get answers as quickly as possible so you can get back to work. Fortunately, Microsoft builds a number of support services into its operating system and will even help you via phone or live chat. 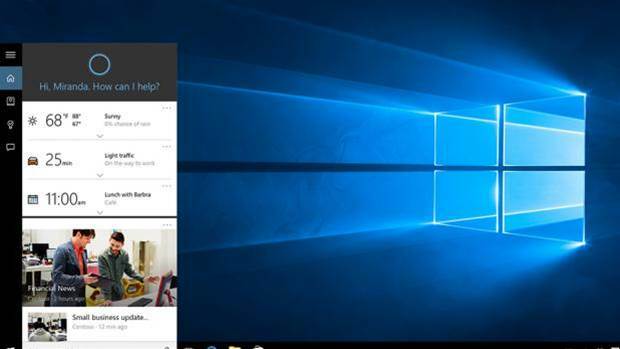 Here are five ways to get help in Windows 10. The F1 key is the original means of finding help, similar to dialing 411. Hitting F1 in an app often opens that program's help menu, but for Windows 10 itself, the button only performs a Bing search in your default browser for "get help in Windows 10, " which you could do yourself. If clicking F1 doesn't bring up such assistance, you may need to enable it by holding down the Start button while you press the key. Failing that, some systems require you to disable Function Lock, which is done by clicking the dedicated Fn Lock key. If you'd rather talk than type, you can ask Cortana for help understanding basic issues with Windows 10. 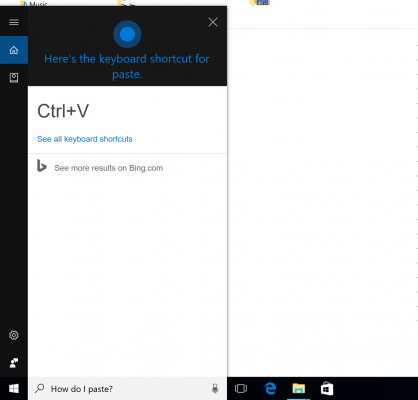 The digital assistant knows about keyboard shortcuts for copy and paste and can even direct you to videos that answer other questions. To activate Cortana, click on the microphone in the menu bar or say "Hey Cortana" if you have that option enabled. For direct interaction with a Microsoft representative, you can use a dedicated app built into your PC. Click the Start button and scroll to Contact Support, and if you don't see that, look for Get Help. Here, you can ask a question or search with keywords to find documentation from Microsoft that will solve your problems. After searching for an answer in Contact Support or Get Help, you'll see options for further assistance at the bottom of the window. These options include arranging for Microsoft to call you now, which should include an estimate for how soon an agent will be ready. If that time isn't convenient, you can schedule a call for later, picking a time that better fits your schedule. Those who would prefer to type can opt for the live chat option. Here at Laptop Mag, we've published more than 100 Windows 10 tips and tutorials to help you answer your questions and become a power user. From our guides to understanding Cortana and Edge to tips for performance and productivity, we've got everything you need to understand Windows 10. If you are facing problems and wondering how to get help in Windows 10, then this post lists some built-in support options, as well as Help Desk, Support or Community forums and websites options, where you can get help. Take a look at these options & resources. 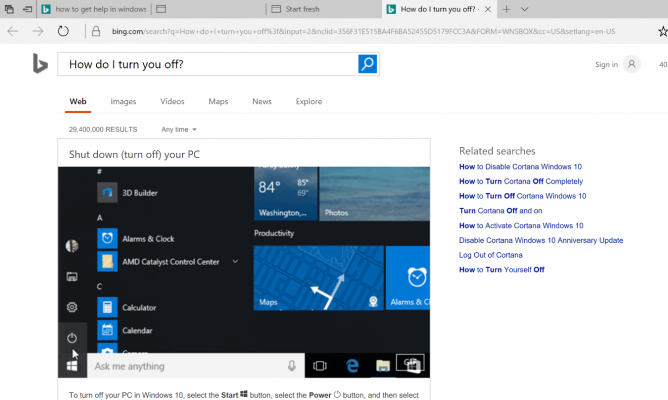 1] Clicking on the F1 key will normally fire up your browser, which will offer you Bing results about Windows 10 Help. 2] Typing help in taskbar search will display the Get Started app in the results. This has a lot of help topics to get you started. 3] Make sure that you have opened Settings > System > Notifications & actions and ensured that the Show me tips about Windows is set to On. 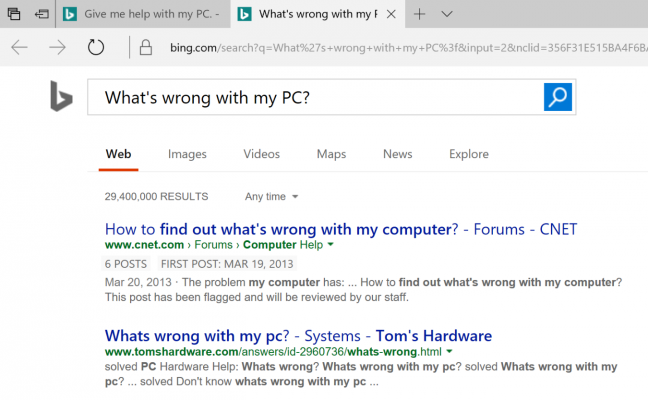 4] You could use the taskbar search bar or ask Cortana to search online for help. 5] Use the built-in Contact Support app to chat with Microsoft. Using it, you will be able to chat online with a Microsoft Answer Tech support staff. Using the app, you can also arrange a call-back. 6] You could use the services of Microsoft Answer Desk, a live paid Tech Support site, to chat with a Microsoft support executive. 7] You can also contact Microsoft Support by email and chat. If a Customer Service Agent is online and available for chat here, you will see a message to this effect. If not, you will see Instant Chat: Customer Service Agents are OFFLINE message, on the right side. You may then try and visit this page for Chat support. Use this form to email Microsoft. They will contact you back via email. 8] You can contact Microsoft Customer Support at Phone Number 1 800-642-7676 or at microsoft.com/contactus. 9] The Microsoft Support Official Twitter Account is @MicrosoftHelps. 10] There are more ways to contact Microsoft Support via phone, etc., including for OEM support. 11] You can also get Windows 10 Help & Support from a Microsoft Store. This post also lists some paid options. 12] Search for your problem citing the specific problem you get or the error you receive using our TWC Search. Chances are high you will see something helpful. If not you may request us to develop a tutorial. If we can, we will do it. Else you can always request support from our forum members at TWC Forums. 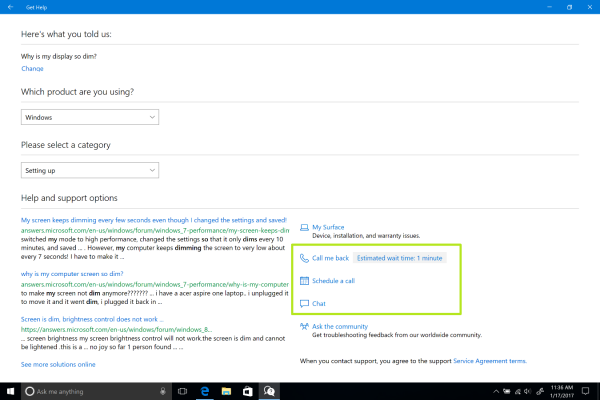 13] You can now also give or take Tech Support remotely using Quick Assist in Windows 10. FixWin for Windows 10 is a portable freeware that allows you to fix and repair issues and annoyances, with a single click. Microsoft Support Diagnostic Tool in Windows, is used by Microsoft Support to help diagnose Windows problems. When you contact Microsoft Support for any help, the support professional will give you a Passkey. You are required to open the Microsoft Support Diagnostic Tool and enter the Passkey. You should know this before hand. The Microsoft Product Support Reporting Tool facilitates the gathering of critical system and logging information used in troubleshooting support issues. This information helps diagnose problems in the software quicker and provide solutions. Microsoft Easy Assist allows a Microsoft support professional to remotely connect to your computer and help you solve a problem. Using a secure connection, the support professional can view your desktop and perform diagnostics and troubleshooting steps. 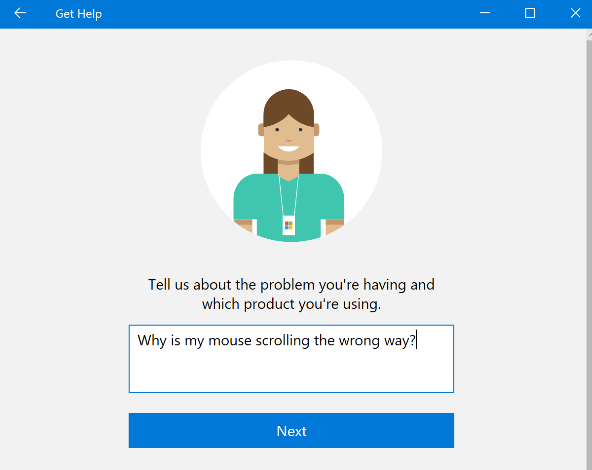 0 Response to "How To Get Help in Windows 10"